Black 7 inch record box - faux snake skin 1980s vintage. Possibly from WH SMITH Hold approx 50 Height :approx 21cm with handle folded down width : approx 21cm depth: approx 16cm Some marking and light scrapes etc.. - please see photos. With key and working lock/clasp. 7 inch vinyl singles carrying case, record box, 7"
The catch has a lock but no key, so is perpetually unlocked. 3 x NEW 100% CRYSTAL CASSETTE STORAGE CASES -. With regards to other high asking prices for new cases, I'm sure you will agree that these virgin crystal cases made by ARKAL are the ones for you! Retro Audio Cassette Case Holds 24 Tapes Black Plastic 80's Vintage Great.... Condition is Used. Dispatched with Other 48h Courier. Job Lot 28 Used Empty Clear Perspex Audio/Music Cassette Tape Cases. Job Lot of 28 Used Empty Clear Perspex Audio/Music Cassette Tape Cases. 6 Sony. 4 TDK. 18 Unknown Make. All in Good Condition Condition is Used. Dispatched with Royal Mail 2nd Class. One Amaray blue case for 6 blu-ray Discs. perfect for those collections you have been building up. 8 x NEW STANDARD CRYSTAL AND BLACK CASSETTE STORAGE CASES -. Photographs show 3 empty cases, but you will receive 8 in total. D.J. CARRY CASE 1970s RETRO, HOLDS 70 SINGLES ,45s CASE IN EXCELLENT CONDITION. Condition is Used. Dispatched with Royal Mail 1st Class. In good condition overall especially considering it's age. Retro Cassette Case 1980s WHSMITH Burgundy with stripes. Carry handle. Holds approx 15 cassettes. Has some cosmetic wear/marks - please see photos. Some damage to lid - split - doesn’t cause any issues. Holds approx 15 cassettes. Clasp is fully functional and locks with included key. Fabulous 80’s red striped music cassette tape case. Holds 45 cassettes. In great vintage preloved condition. A few minor marks on the outside case and there’s a couple of dents in the plastic inside storage rack but they still hold cassettes perfectly fine. A great retro piece! Dimensions are 40cm across, 32cm Wide and depth 8cm. From a clean and smoke free home. Please pay by PayPal within 48 hours. I always obtain proof of postage. I'm having a huge clear out. Please check my other listings. Any questions, fire away. 50 x Used black plastic tape cases so may have minor scuff marks but no cracks in them. Audio Cassette Tape Storage Case Box Retro Tape Storage - Gold. Condition is Used. Dispatched with Royal Mail 1st Class. Vintage Retro Cassette Briefcase Storage Holder Red Striped. I have for sale a retro briefcase style cassette storage holder. It has a red background with thin gold, silver and black diagonal stripes. As you can see from the photos the holder is in good used condition. 5 x CD cases, transparent green plastic. Never used, have some faint scratches from storage. INSIDE EACH THERE ARE 20 CLEAR PLASTIC WALLETS OR SLEEVES TO HOLD THE RECORDS. 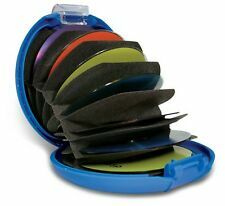 The DiscGear Discus 20S is a compact and durable storage case for up to 20 data discs. 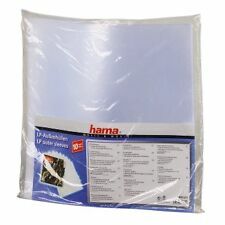 Also, double-sided cloth sleeves help prevent scratches and dust accumulation. Compact and durable design with wrist strap. Holds up to 16 audio cassettes. Size is approx 36 cm across x 8 cm tall x 11 cm deep. WHITE BACKGROUND WITH COLOURED JAZZ ICONS ACROSS IT. INSIDE EACH THERE ARE 20 CLEAR PLASTIC WALLETS OR SLEEVES TO HOLD THE RECORDS. If you look closely at the main photo, you'll notice that the catch on both cases is missing. That said, that's why they're going as a pair and cheap too. No one talked about global warming, climate change or the unaffordability of a house when I bought these. Cassette Case Malibu White Rum Retro . Dispatched with Royal Mail 2nd Class. IN A DARK BROWN( NO KEY). Takes 12 Cassettes. Condition is Used. CASSETTE CASE. and i will always do my best to sort out any problem. and let's sort it out it all out. hands of a third party. IN BLUE /PATTERNED. Great original case. in great condition / light wear. This item is in good condition. There is a hole in the corner of the case. SEE photos for details. Any questions please feel free to contact me and check out MY OTHER LISTINGS where I have more audio items for sale. 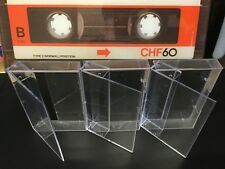 4 x Empty Clear Double Audio Cassette Tape Cases for Music, Talking Books etc. Each case holds two standard size audio cassettes. The cases are not all identical 2 x are ribbed on three edges. 1 x has right angled corners. Height - 10.9 cm. Width - 14.1 cm. Condition is Used. Sold as seen. Both are identical and marked Tontarelli,I believe made in Italy. Two audio cassette storage boxes, each holds 12 audio tapes,24 in total. Both are in a used condition with minor marking and wear but are still all fully functional. 1960's [ish]. Plastic covered hardboard. Vintage 1970s 1980s Audio Cassette Tape Carry Storage Case Holds 45. Condition is Used. Dispatched with my Hermes tracked. Some light marks and stains could benefit from a clean but nothing major. Please see photos for details and condition. Any questions please ask. Holds 45 cassettes. Width-40.5cm Height-8.5cm Depth-32cm Approx. Condition: EXCELLENT with just a couple of very small storage marks on the back (see photos), otherwise no other markings or frayed edges. Hardly used. These items are in very good condition. SEE photos for details. Any questions please feel free to contact me and check out MY OTHER LISTINGS where I have more audio and visual items for sale. Superb Vintage Tan Carry/Storage Case For 12" Looks Records: 1960's - A BEAUTY!